The developer’s site says that TimeTracker is an automatic employee time and productivity tracking software. We do not test such software for its detection and removal. But one of our customers asked us if COVERT Pro could protect him from this program. It turned out that this program is installed on his home computer, and this is something different from the statement of the developers. Testing Yaware.TimeTracker showed that it has the same functionality as a typical spyware – it takes screenshots and sends them to the developer’s server. You can install it not only on the corporate system, but also on any computer. Therefore we decided to publish instruction on detection and removal Yaware.TimeTracker or hide your work from this program. It’s periodically sending collected information to an external server, that’s why its presence can be found in the network monitor of COVERT Pro. However the Yaware.TimeTracker module visible only during transfer of the data, and the rest of the time it is not there. But in the “System Services” monitor we can constantly see the service named Yaware.TimeTracker Collector Service, which is highlighted in red, as it is included in the database of threats of COVERT Pro. Another place where you can see a component of Yaware.TimeTracker is the monitor of system processes. In its list we can see two processes – YwService.exe and YwClient.exe (they are also highlighted in red). If you have found any of mentioned files on your work computer, then your management controls all your activity. This shouldn’t be surprise for you if you signed the corresponding document. If you were not warned, you can use COVERT Pro secure platform with a clear conscience and perform actions with your personal information that you do not have to disclose to your employer. You shouldn’t delete modules of the monitoring program, otherwise the system will notice that you are not working. If you enter to the COVERT secure platform, Yaware.TimeTracker will not see your actions, but the time you spend inside the platform will not be counted as working. We can set up the monitoring program to make screenshots and photos using web-camera every 1-2 minutes. After that, enter to the secure platform and perform any actions – web browsing, typing text in any editor, watching video. Exit from platform in 15 minutes and check logs of Yaware.TimeTracker. Monitoring system couldn’t save any information during this period. We can see that the program did not take pictures for 15 minutes. Yaware.TimeTracker took pictures only before the user entered the platform and after leaving the platform. A similar situation with web camera shots – a failure in 15 minutes period. The shots were taken, but they were not saved. This monitoring system collects information, saves it in hidden places, and after a certain period of time, transfers it to the developer’s server. While user stays in the protected platform, the data is not stored by the spyware. After the user leaves the platform, Yaware.TimeTracker’s work is restored and data saving resumes. If you find the monitoring system modules on your home computer, delete them. In the “System Services” monitor, right-click the Yaware.TimeTracker Collector Service line (highlighted in red), in the context menu select “Open the service folder” first, then “Stop the service“. 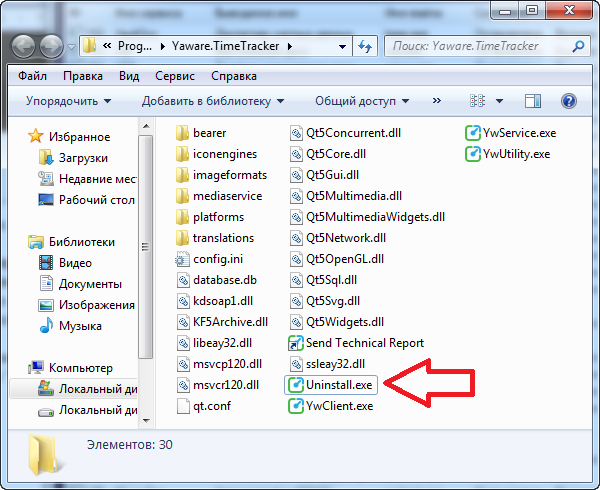 In the Yaware.TimeTracker folder, run the Uninstall.exe file, which will remove all components of the monitoring program. Checking YwService.exe with 39 antiviruses showed that only one of them considers this file as a threat. This is the standard reaction to the most of tracking programs. We rate this spyware program as RLM: 4 / 0 / 1.